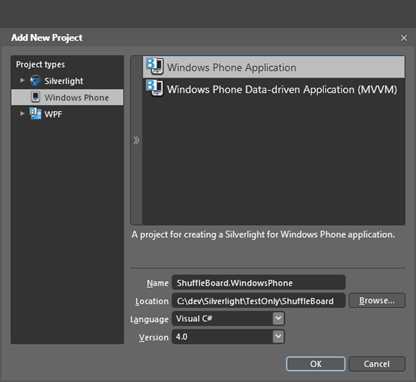 In this walkthrough, we will create a table shuffleboard style game for Windows Phone 7 using Silverlight. 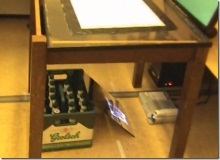 Many bars feature these long wooden table games, in which players slide metal pucks down the length of the table, attempting to get as close as possible to the far end without sliding off the edge. Windows Phone 7 uses a version of Silverlight 3 with a few bonus features. Because this version of Silverlight is so close to the Web version of Silverlight 3, we'll take the approach of Multitargeting a solution for both platforms. To do so, start with a Silverlight 3 (web) application template, and then add in a Windows Phone project with linked files that re-use the Silverlight 3 solution. 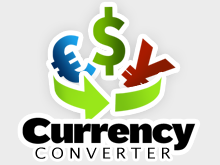 This allows us to deploy to many different platforms using the same code base. Let's get started by creating our Solution in this way. 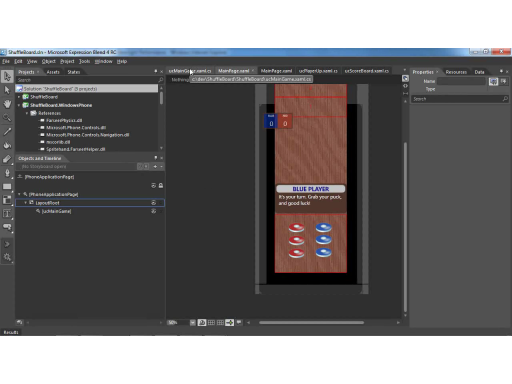 In Expression Blend 4, create a new Silverlight Application + Website template named Shuffleboard. Be sure to select “3.0” from the Version dropdown, as this is what is supported by Windows Phone (in a little bit we'll add in the Windows Phone project template as well). 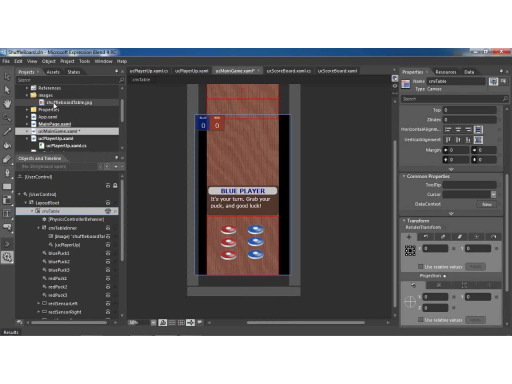 In the Objects and Timeline Panel, select the main UserControl and set its Width to 480 and its Height to 800. This is the size of a Windows Phone UI in Portrait mode. Select the LayoutRoot Grid and set its Width to 480 and its Height to 800. For games, a Canvas layout container is better than a Grid, so let's change the LayoutRoot container type. Right-click LayoutRoot and select Change Layout Type/Canvas. This XAML is snippet “MainPage Clip” inside snippets.txt. Next we'll create a separate user control that will contain the core game logic. By creating a separate user control, we can easily target different platforms by placing the user control inside different MainPage elements. Right-click the Shuffleboard Silverlight project and select Add New Item. 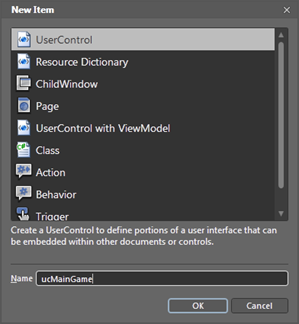 Select UserControl and name the control “ucMainGame”. Change the LayoutRoot element from a Grid to a Canvas. 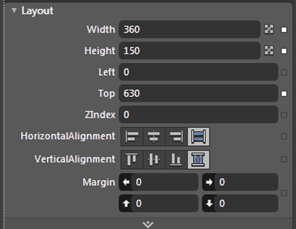 Set the Width to 480 and the Height to 800 for both the UserControl and LayoutRoot Canvas elements. Set the Background color to Black for the LayoutRoot Canvas. Build the project by pressing Ctrl+Shift+B. 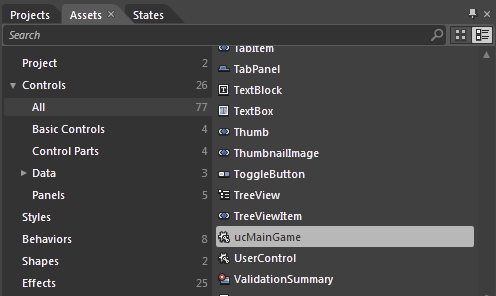 Back on MainPage, add an instance of ucMainGame to the page by going to the Assets Panel and expanding Controls/All. 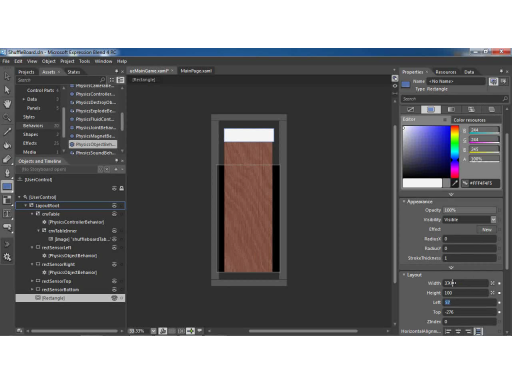 Drag an instance of ucMainGame to the artboard. Rename the ucMainGame control to ucMainGame1. Set the Left and Top properties of ucMainGame1 to 0. 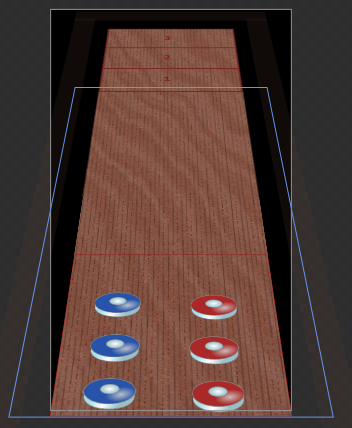 We'll use a pre-rendered PNG image for the shuffleboard table. Create a new subfolder in the Silverlight project named “images”. Open the ucMainGame user control. We will need to detect when a puck hits the edge of the table and “falls off.” Let's add in some Rectangle elements and add Physics Behaviors to them. Drag a PhysicsObjectBehavior from the Assets Panel Behaviors onto rectSensorLeft, and then set its IsStatic property to true. Now we'll add in the goal Rectangles at the end of the table. These will be used to determine the number of points a puck receives. 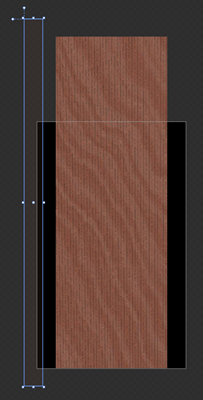 Draw out three Rectangles that cover the width of the board and are 100 pixels high. Name these rectPoints3, rectPoints2, and rectPoints1. Set their Stroke to Red and their Fill to No brush. For the pucks, we are going to add in an existing control which has the artwork completed. 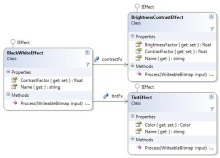 Right-click the project and select Add Existing Item. There is a “cnvInner” Canvas that defines the look of the Puck. There is a StoryBoard defined, sbLostPuck, which we will execute when the puck “falls off the edge” of the table. Open the code-behind file, ucPuck.xaml.cs, and note the get / set property for the color of the puck. This will allow us to create both Red and Blue pucks for each player. Build the project by hitting Ctrl+Shift+F5 and go back to ucMainGame. From the Assets Panel, expand Controls/All and find the ucPuck control. Drag an instance of this onto the artboard. Name this bluePuck1. Copy and paste bluePuck1 twice so that you have three blue pucks. Name the new pucks bluePuck2 and bluePuck3. Copy and Paste redPuck1 two times and rename these new pucks redPuck2 and redPuck3. Let's test our table. 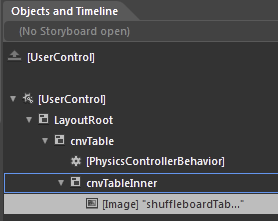 Find the PhysicsControllerBehavior just under the cnvTable Canvas in the Objects and Timeline Panel and set the MousePickEnabled property to true. Run the project by clicking F5. Try dragging some pucks around with the mouse. We need a way of tracking players' scores, so let's add in a simple scoreboard for Blue vs. Red. It has a TextBlock for Red scores and a TextBlock for Blue scores. In the code-behind, there are setters and getters to set the score. Build the project by selecting Ctrl+Shift+B. Drag an instance of ucScoreBoard from the Assets Panel onto into LayoutRoot. We'll need a simple control that displays which player's turn it is. 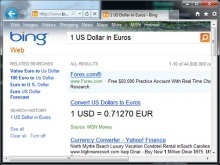 Right-click the Silverlight project and select Add/Existing Item. 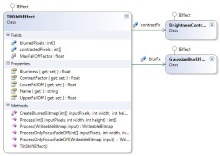 The code-behind file has a simple property, IsBlueTurn, which shows the appropriate message in the UI. Back on ucMainGame, drag an instance of ucPlayerUp into cnvTableInner. Let's give our table a bit of a 3D look by adding a Perspective transform so the table appears to go off into the distance. Create a new StoryBoard named sbRotateTable. Select the cnvTable Canvas element. Advance the timeline ahead one second. In the Properties Panel, under Projection, set the X value to -40. Close the Storyboard to end recording. This code is snippet “ucMainGame Imports” inside snippets.txt. This code is snippet “ucMainGame Declarations” inside snippets.txt. In the ucMainGame() constructor, add some code to set the MaxFrameRate to 30 (Windows Phone will be limited to 30 FPS) and wire up the Loaded event handler. This code is snippet “ucMainGame Constructor” inside snippets.txt. Implement the ucMainGame_Loaded event handler, which gets a reference to the Physics Controller and wires up our event handlers. This code is snippet “ucMainGame Loaded” inside snippets.txt. Next, we'll add in the event handlers that we just wired up in the loaded event. Note that the Initialized event starts the Rotate Table StoryBoard. This code is “ucMainGame Event Handlers” inside snippets.txt. Run the Project by clicking F5. Note the 3D look and try manipulating the pucks with the mouse. Next, we'll add logic to control the player's turn and control and along with score. Note that, when we implement the Windows Phone version in a bit, we can take advantage of Multitouch Manipulation events. But since these events are not available in the Web version of Silverlight 3, we'll use a simple mouse input mechanism. Let's turn off the default mouse manipulation. Select the PhysicsControllerBehavior just under the cnvTable Canvas and set the MousePickEnabled property to false. We need to get references to our Pucks, which the Physics Helper has translated into PhysicsSprite objects. 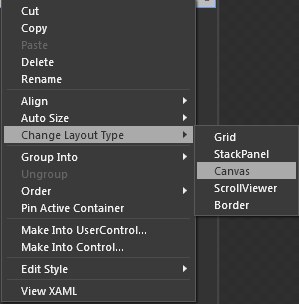 A Physics Sprite contains the XAML UI for the Physics Object, plus the Physics Engine attributes for the underlying physics objects–including boundary shape, mass, velocity, etc. This code is “ucMainGame Initialized” inside snippets.txt. Now we need to handle the Mouse events on the pucks in order to control the player's shot. When the player clicks the mouse down on a puck, we track the position along with time that they clicked. When the player moves the mouse, we update the puck position and also check if the player paused or moved backwards. We do this in case the player is just adjusting the puck position and not yet sliding the puck for a shot. Finally, in the Mouse up event, we release the puck in the specified direction and apply an appropriate amount of force to it. Copy in the snippet “Puck Mouse Control” from snippets.txt. Code is not shown here for brevity. 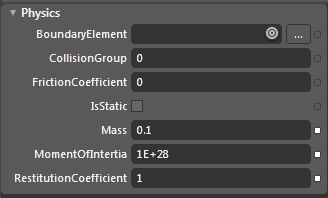 When the Physics Helper Library does its magic, it translates existing UI Elements into PhysicsSprite objects. So what if we want to get at the original controls, perhaps to execute a StoryBoard that we defined on them? We can do this by using the FindName method to get the original user control instance. So, add the code below, which we'll use to get a reference to the Puck Storyboard “sbLostPuck”. Finally, to score, we'll determine if the puck lies between any of the Rectangles in the end zone. This code is the snippet “Get Points for Puck” in snippets.txt. Most games are controlled by a “Game Loop” that executes many times per second. Within this Game Loop, we can check for collisions, perform enemy AI, and scoring. The PhysicsController fires an event called “TimerLoop” that we can use for this purpose. This code is snippet “Timer Loop” inside snippets.txt. // did the shot clear the end zone? 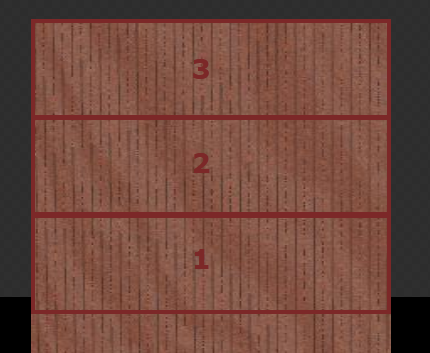 So far, we've created a Silverlight 3, web-based version of a shuffleboard game. Next we'll quickly port this to Windows Phone, taking advantage of some of the platform's capabilities, such as multitouch. We'll do this by using linked files that point back to our existing Silverlight 3 project. 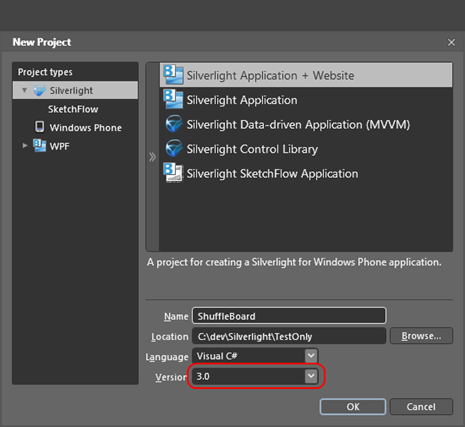 Right-click the Silverlight solution in Blend and select Add New Project. 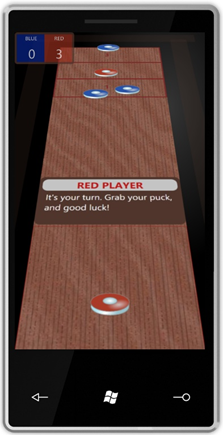 Select Windows Phone Application and enter ShuffleBoard.WindowsPhone for the name. Delete the TitleGrid and ContentGrid elements from the Objects and Timeline Panel. 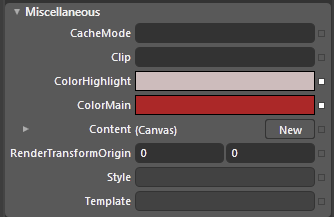 Convert LayoutRoot to a Canvas by right-clicking it and selecting Change Layout Type/Canvas. We need references to the assemblies used for Behaviors. An easy way to do this is to add a Behavior to an element and then delete it. 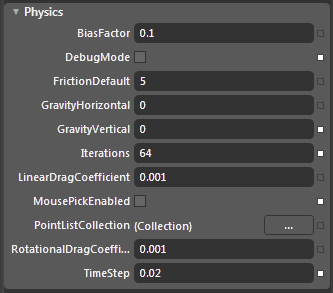 From the Assets panel, drag a PhysicsControllerBehavior onto LayoutRoot and then delete it. Note that this adds a reference to System.Windows.Interactivity to the project. 8. Add a new folder to the project named images. 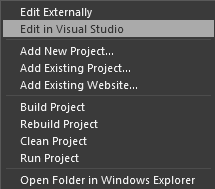 Build the project by clicking Ctrl+Shift+B. From the Assets Panel, under Controls/All, find ucMainGame and drag an instance onto LayoutRoot. Set the Left and Top properties to 0. Right-click the WindowsPhone project and select “Startup” to set this as the startup project. Run the project by clicking F5. So far, we've used a simple mouse-event-based input mechanism for shooting the pucks. But on the Windows Phone 7 platform, we can do better than that by using Multitouch events. These events include an inertia property that will make our puck physics more realistic. Since we are going to need to support two different platforms now (Web and Windows Phone), we need to introduce a Conditional Compilation Symbol so that the compiler can differentiate between each platform's code. 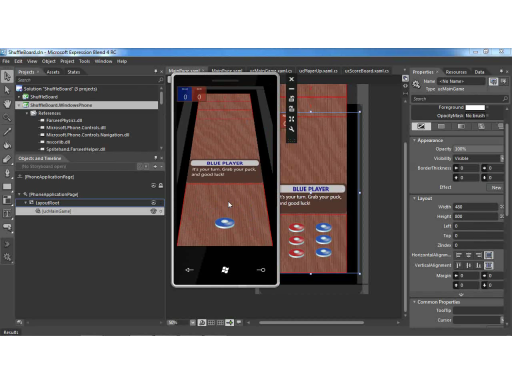 Right-click the ShuffleBoard.WindowsPhone Project and select Properties. 4. Add in a new compilation symbol for WINDOWS_PHONE. NOTE: Future releases of WP7 Tools will likely define a default compilation symbol, so you may already see one defined here. This code is snippet “Manipulation Events” inside snippets.txt. Run the project by clicking F5, and try sliding some pucks. 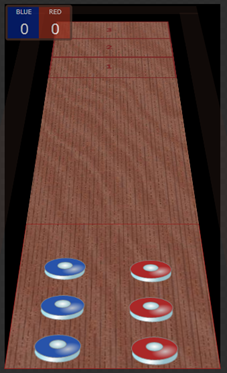 Depending on your configuration, you may experience poor performance for the shuffleboard game when running it in the Windows Phone emulator. There are different reasons for this, including video card drivers and virtualization settings. Please refer to this blog post, which details these performance considerations. Run the project by hitting F5, and note the current frame rate. NOTE: Your development configuration may prevent you from having an adequate framerate in the Windows Phone Emulator! Please refer to this blog post for tips on emulator performance. One performance tweak we can easily make is taking advantage of hardware acceleration. Silverlight enables us to use the video card to render elements, which can greatly increase performance. To do this, we add a Cachemode=”BitmapCache” attribute to any elements we want to hardware accelerate. Open ucPuck.xaml and note that there is a CacheMode attribute on the Puck Canvas. Open ucMainGame.xaml and add a CacheMode attribute to the cnvTable Canvas element. Run the project and note the frame rate change. Sound is one area where Windows Phone and Web Silverlight differ a bit. Under Silverlight for Web, we can use the MediaElement class to play back WMA and MP3 format audio. Multiple instances of the MediaElement class can be played simultaneously, and the sound output will be automatically mixed. However, on Windows Phone we have access to the XNA game libraries, including sound support. This is a much more efficient way to add mixed sound to a Silverlight game on Windows Phone, but it only supports WAV format sound files. The Physics Helper Library has a useful class wrapper for sounds, which we'll use to play a “hit puck” sound on both platforms. In the ShuffleBoard (Silverlight Web) project, right-click and select Add Folder. 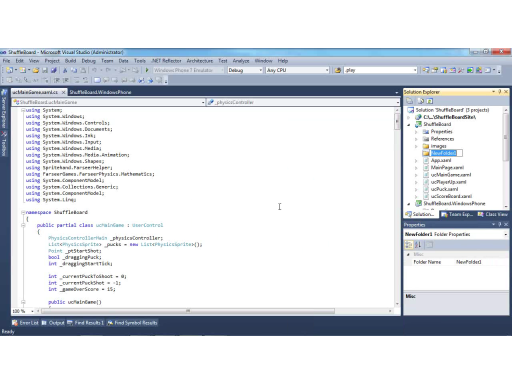 Set the Build Action of the file to Content. In the ShuffleBoard.WindowsPhone project, right-click and select Add Folder. This snippet is “Declare the Sound” inside snippets.txt. 10. Inside the ucMainGame_Loaded event, add code to declare the two sounds. Note that Windows Phone uses a WAV format sound without a “/” prefix for the root. This snippet is “Play the Sound” inside snippets.txt. Run the project and try hitting pucks together. Since the 1.1 Alpha release, Silverlight has offered a compelling casual game development environment. With the addition of Windows Phone, along with demos of Silverlight running on other embedded devices, you can bet the future of Silverlight for gaming is bright. @ge-force WPF sure with a bit of work, you could do a Silverlight OOB (Out of browser) as well and that should "just work". Windows form, not scrapping almost everything. 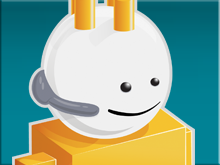 !his is great - would it be easy to do in a wpf or windows forms app? Excellent work Andy. Which version of expression blend are you using? Where can I download/buy it from? Thanks Andy. I am unable to use Expression blend for phone because of the poor performance of emulator on my system (my system's GPU is not supported i reckon). So I was thinking of following your lead and develop silverlight games for web initially - and later port them to phone.